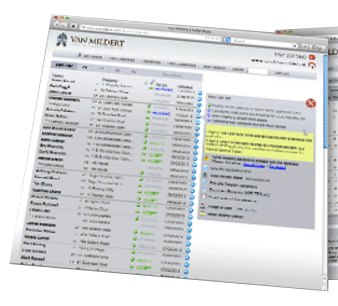 Acquaint integrates with leading providers Van Mildert to offer advanced, online and real-time Tenant Referencing services, Rent Guarantees and Tenant's insurance. Online Referencing will enable you to get the results you need faster and more accurately, enabling you to minimise risk and maximise landlord satisfaction. 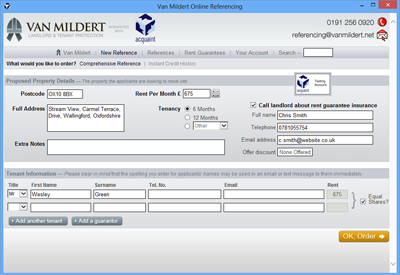 Add a Pre-Tenancy in Acquaint then simply click Yes to instantly order an Online Tenant Reference or from the References screen simply click the Online Ref button. You can order references without having to type anything onto their ordering form. It literally takes 2 to 3 seconds. Then when you want to know what's going on with it, one more click (no logging in required) and the tracking page comes up within Acquaint. A Home Page Reminder helps you manage pending references. * Trial account applies to new Van Mildert clients only.